The discordant note is an example of TED’s at times uneasy relationship to corporate sponsorship as the nonprofit organization pursues its future as a global media brand focused on learning and social change. You’ve heard about the lovely and amazing, now let’s hear about the duds of TED. 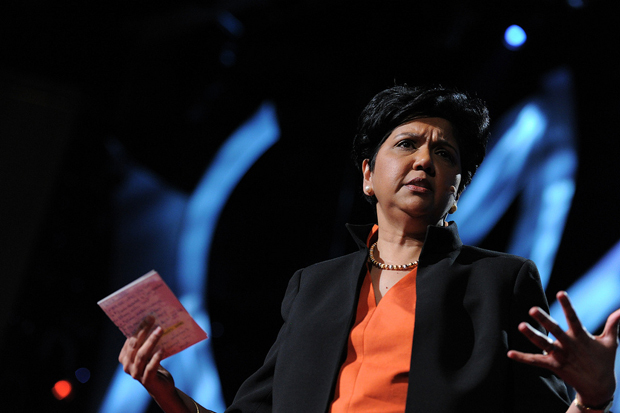 “Only 5% of TED Talks have been given by CEOs,” Pepsi chief Indra Nooyi observed from the stage at TED, before going on to demonstrate why. Her bland recitation of the accomplishments of Pepsi Refresh, a decent, though hardly groundbreaking corporate social responsibility program, had some attendees wondering if it was a paid product placement. That’s why I was surprised to hear Chris Anderson, TED’s director, single Nooyi’s talk out for special attention at a lunch for journalists as both a great talk and a stellar example of corporate communication. The discordant note is an example of TED’s at times uneasy relationship to corporate sponsorship as the nonprofit organization pursues its future as a global media brand focused on learning and social change. While product demos, especially of new technology, have always been part of TED, there were many who felt that the balance of corporate voices was off this year. TED Talks now have over 400 million views, and the self-organized TEDx program has gone viral, with over 1,800 events taking place around the world. Initiatives such as TED Conversations, a set of new social tools on TED.com, TED ED, a new education site, and the $100,000 TED prize require significant corporate sponsorship. One attempt to respond to this increasing involvement with sponsorship is the “Ads Worth Spreading” contest, wherein TED asked companies to create long-form video ads that were good enough to share. “To make a difference in this world, you have to engage corporations,” Chris Anderson told the press. “We want to change how corporations talk to us–they should talk to us like adults.” While many of the commercials, which were shown to TED’s paying audience, were funny, heartwarming or inspiring, it remains unclear, at least to me, how commissioning more appealing ads relates to TED’s core mission, or how it will really elevate the conversation.